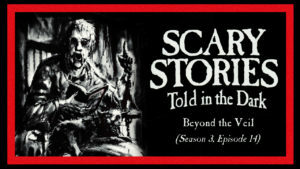 Welcome to Season 3, Episode 9 of Scary Stories Told in the Dark, starring Otis Jiry. In this episode of Scary Stories Told in the Dark, we bring you four terrifying tales from authors The Dead Canary, EldritchVulpine, Micah Rodney, and Cameron Suey, performed by host and narrator Otis Jiry, about devilish deals, lurking legends, revenge-seeking revenants, and island abominations. The version of this podcast which is made freely available here contains the first story listed. To enjoy the premium, extended version of this episode – as well as our extensive audio archive of other terrifying tales – please sign up for a Patrons accounts today.